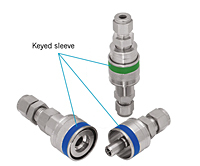 Keyed quick connectors can prevent accident caused by intermixing of different lines in multifluid and multipressure systems. Keyed quick connectors are easily able to identify same colored bodies and stems. If same colored bodies and stems are not connected, the valve system will not operate.